Benjamin Franklin once said that “you may delay, but time will not, and lost time is never found again”. Yet so many people (and especially students) struggle with how to beat procrastination. So how can we help them manage their time better? We have discussed the benefits of sleep and common sleep mistakes at length in previous blogs, but we have not looked at the positive effect that good energy management throughout the day has on performance. Our daily biological clocks, known as our circadian rhythm, ensure that we are often at our most alert at about 10am before we suffer a mid-afternoon slump. The harder a task is, the more energy and focus we need to complete it. It therefore makes sense to do the hardest and most important tasks early because starting them when you are tired is more difficult and often results in putting them off for another day. Recent surveys indicate that 75% of students consider themselves procrastinators, with 50% doing so regularly and to a level that is considered problematic. People are more likely to procrastinate on tasks they find difficult. Getting the hardest task done early in the day is one method to overcome procrastination and will make you more productive overall. Some new research has emerged suggesting that the more difficult an initial task is, the better you will perform on subsequent tasks. However, it was worth noting that there are some other studies that show that this may not be true for everyone, so it is worth trying and doing a bit of trial and error on this one. It has been established that we tend to underestimate the time it takes us to complete tasks. This means that by starting your hardest task toward the end of the day or close to the deadline you may not have time to finish it, as we are not good at allotting the correct amount of time for tasks. By starting your hard task early, with plenty of time to complete it, you allow for an error in predicted completion time and will still get it done by the deadline. It makes sense that your hardest task is the one you will likely struggle with the most. If you are struggling with something, getting feedback and advice can be a great help. Your parents and family can be a great source of advice at home, while your teachers, classmates and friends can offer useful feedback and support at school. If you leave this task until the last minute, you may not have enough time. By starting your most challenging task with plenty of time to complete it, you give yourself the greatest opportunity to get feedback from your teachers and support from the people around you. Leaving your most challenging tasks until the last minute is common but unwise. 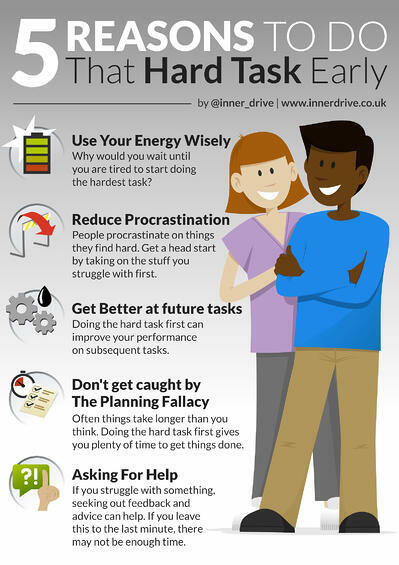 There are many reasons to tackle your hardest task early, which will lead to better performance on not just this task but future tasks too. This can help minimise procrastination and enhance student outcomes. 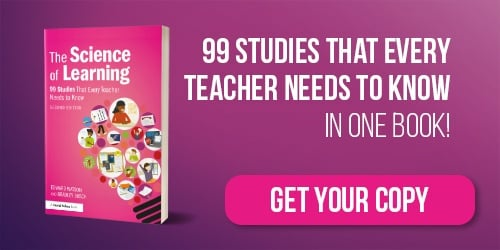 If you are looking for more ideas on good study techniques including best practice approaches to revision, visit our best ways to revise page which contains links to free resources and other blogs.